I cogitate, but little – ergo I'm dim, some. Caesar and the rest of the conquering types must be so glad they didn’t have someone like me gumming up the works with long articles to read just as they’re getting ready to go out and do their bit to reduce the human population by massacring a few thousand soldiers. I haven’t written anything in ages, so quit complaining and read along, will ya?! Thought I’d ramble on inconsequentially about the thoroughly enjoyable birthday weekend trip the girls and I took to the Orange County Resort on the Kabini river near Mysore. The trip worked out perfectly. The place was *AMAZING*. The cottage we stayed in had a courtyard pool was simply awesome and as expected, the kids and adults had a BLAST. We had an elephant interaction event on the second day. The elephant was a ponderous looking 47 year old female who is counted as part of the resort staff :). And befitting her status as member of the staff, she gets a big barn alongside the staff quarters, in the same compound :). We first had a ride on the elephant, which was a fun experience. Since we were four on the elephant, with me sitting on the tail end of the beast, I had very little space on the cushion on top of the elephant. I was forced to sit half on the cushion and half on the backbone/tail-end of the elephant. I was shocked at how very unlike a limo-ride it was. First – the hair is poky and not fun when wearing shorts. Second, the elephantine backbone has a mind of its own and moves in mysterious ways its wonders to perform. Sitting on it was ticklish in the extreme. I tried taking Jesus’ excellent advice and turned the other cheek – and then the other. It was of no use. Obviously not in tune with Jesus’ teachings, these elephants. I was laughing uncontrollably all the while – and the elephant, sensing something on its rear-end, and unable to appreciate my mirth, kept swatting me with its tail. Quite a sting it packed, I can tell you from experience!!. After the ride, the elephant, monosyllabic mahout and us, all trudged to the river, where the elephant just plonked itself into the water and proceeded to wallow in the shallows and cool off, glad no doubt to be rid of my annoying presence on its back. 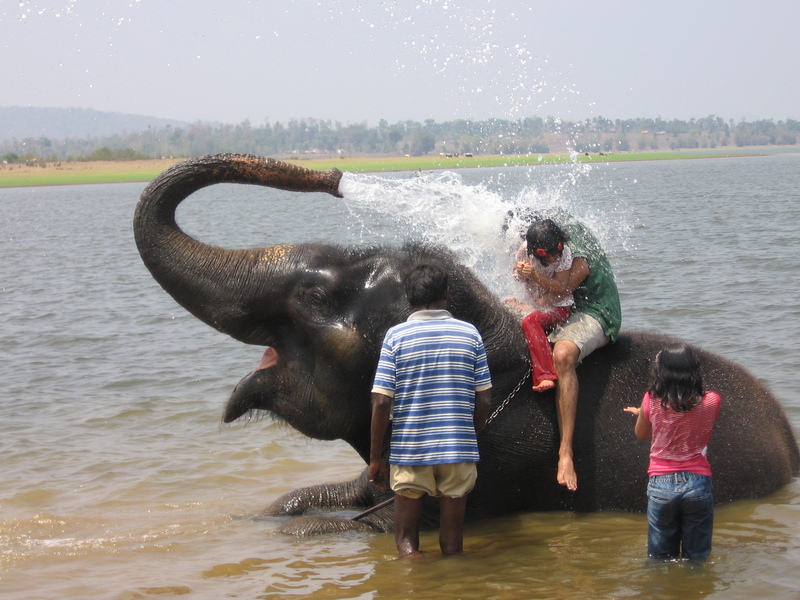 After a few minutes of this, the mahout suggested I take Akshara and sit on its back. Seeing that he was armed with a sharp looking instrument, I did as instructed – and the damn pachyderm, without giving me as much as a gentle warning, got sweet revenge by filling its trunk with water and soaking me to the BONE with the filthy muck in which it had just frolicked!! . And having relished the experience, proceeded to do this three more times. By the time we were done, I admitted defeat – and Akshara bawled her lungs out in fright. Alekhya, the daredevil in the family, went next and thoroughly enjoyed getting soaked with water and slush. Definitely the highlight of her trip! We took the boat safari in the evening – lot of fun, but all we saw were bored looking elephants (probably envying their captive sister who managed to soak humans for fun) and a few grazing deer. The resort guys have a good scam going. First they build the suspense up when you reach by having their walkie-talkies crackle incomprehensibly. They look up at you with a grave expression and say things like – “ooh, excuse me sir. I’m getting alerts about a Tiger/crocodile/leopard sighting.” (What he forgot to mention was that this was a Tigger doll that some kid had taken along on the safari). This gets one all excited and the next thing you know, you’re signing up for the safari, convinced that you’re going to spot a tiger or leopard, secretly hoping that you can watch it feasting on one of the plump and overfed tourists from one of the other resorts in the vicinity. With this happy thought in mind, we boarded the boat and off we went. We saw some “spotted deer” on the way – i.e. deer that have been spotted many times, love being spotted and will continue being spotted and are hence called spotted deer. Explains why there is no such thing as a “spotted tiger” – nobody has spotted one! We saw a herd of elephants grazing absent-mindedly. The best part was a teeny tiny tot that was part of the herd. Barely a few months old, the little critter kept hiding between his/her parents’ legs and for their part, they were fiercely protective of his/her super-natural cuteness and didn’t let us take too long a look at him/her. It was a wonderful scene to see them enjoying their food in the wild. Sort of made us feel very happy to see animals in the wild. All’s well with the world and all that, if you know what I mean. But we did not see any tigers. There was this one time when the (spotted) guide on our boat sat upright in his seat and said in a hoarse whisper – “Did you hear that?!!!”. “What?”, I asked, rather cluelessly. “That was the roar of a (unspotted) tiger”, he said, resorting to that dramatic stage whisper again. The rest of the tourist herd looked suitably impressed. I didn’t dare tell them that it was actually my stomach rumbling in anticipation of the evening meal – much like the tiger’s stomach upon sighting that oft-spotted-deer. After we got back, there was the evening festivities to look forward to. At 7:30 every alternate day, the resort has a “tribal dance”. An event aimed squarely at those either white in the skin or those a little soft in the head. A bunch of morose looking blokes gathered around a fire, squatting and muttering amongst themselves. We were all seated around tables in the open, being plied liberally with beer and fried stuff of indeterminate, but tasty origin. The lake/river shimmered nicely in the full moon. All in all, a pleasant scene. Suddenly one of the blokes called for our attention. Introduced himself as a tribal – a “Kaadu Kuruba” he said. Said his brethren were going to entertain us with a few tribal dances. Rambled on in broken English for a few minutes, liberally using the phrase “very spiritual dance” many times during his monologue. He had a knack for the dog and pony show. Really knew how to use the term “spiritual dance” whenever the audience’s enthusiasm was flagging. The dudes gathered around the fire. One of them started beating the drum and the other played a musical instrument that seemed to have passed its use-by date several decades ago, putting out a particularly mournful tune that had me wishing I was in the jaws of a crocodile. The blokes linked hands and started shaking their legs, moving around the fire in circles as they hooted, made guttural sounds and seemed to shout what unmistakably sounded like “Aaaaiii-Yaaaayyiiii-YYYooooo” said in a mocking tone. This being done and photographs clicked by some of the more gullible tourists, the talking tribal elder came up and again said a lot about spiritual dancing. Full of spirit he was, I could tell (and smell). The second dance began – and what do you know… I couldn’t tell one spiritual dance from the others. Same sound, same moves, same whistling and shouting. These spiritual dances are subtle in their differences. I couldn’t tell what these differences were. I guess the spirit wasn’t with me. The talking man did some more talking and the message was the same – spiritual dance, blah blah, spiritual dance, yakety-yak, spiritual-dance, hey-nonynony, thank the Gods for future years. And… you guessed it. Same dance, same song, same spirituality. Mysterious. Baffling. I looked at the note on my table. It read “Please refrain from giving money to the tribals because it may offend their sentiments, If you wish to help them, please hand over the notes (preferably in crisp $100 bills) to the manager of the resort”. Nice eh? OK – I jest about the $100 bills, but the rest is true. Sheesh – I pick nits a little too liberally. The whole experience was fantastic. The boat ride, sans tiger sightings, was awesome. The elephant encounter was worth the price of admission. The pool in the room was PHEW! AWESOME. The whole resort is beautifully landscaped and perfect to the last detail. There was a reading room next to the water that was serene. Water all around, birds chirping, the distant sound of resident naturalists bull-shitting about tribal living to foreign tourists. Perfect. The only jarring note as we sat there was this guy yaking away on his cell phone about God-knows-what. Felt like clobbering him on the head and feeding him to the nearest (un-spotted) tiger or leopard. The food!!!! It was simply amazing. Every meal was a humongous spread of cuisine from every part of India and outside. The local cuisine was particularly amazing. Meat, vegetables and dessert cooked in the local style, an array of dishes from various parts of India, Pasta made to order, fresh fish, the list goes on. This was the best part of the whole experience. I must have undoubtedly gained a few pounds on this trip. I saw the resident elephant eyeing my round shape with undisguised envy on the last day as she sulked ashamedly about not tucking into enough of the fatty foods on offer. Taking notes, she was…I could tell. There is an emerging class of resorts in India that can compare with any around the world. This was one of them. The service was impeccable. Cleanliness and attention to detail on par with any other place I’ve seen. Absolutely fantastic. Definitely two thumbs up. Sitting here in the office and laughing my head off….Hilarious, Guru…. Into each life tons of rain must fall Holy Pumpkins!! Grit + Gumption = Glory. What Roger Federer and Rafael Nadal can teach us about lasting success. Wait…Do good things really come to those who wait?! It’s a tough job having a hire purpose in life.